This winter semester’s lecture series by the Excellence Cluster “The Formation of Normative Orders“ is entitled: “The End of Pacification? The Transformation of Political Violence in the 21st Century”. The series takes a closer look the ways war and political violence have changed in the 21st Century. A common narrative arguing that over time the world is steadily becoming more peaceful is being increasingly called into question. 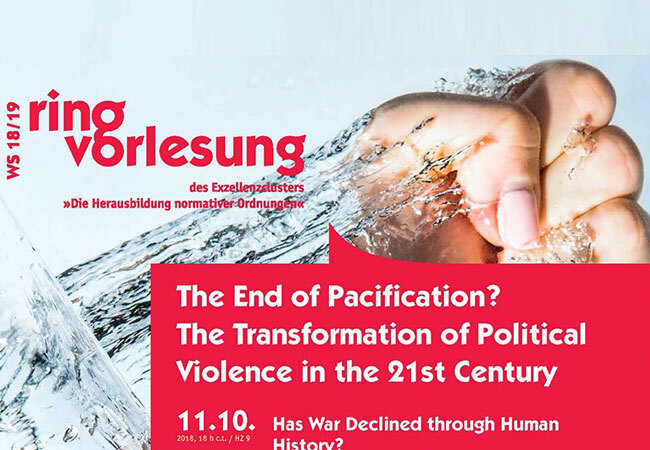 In view of transformations in the forms of warlike conflicts – from cyberwar through terrorism to new forms of civil war – has the hypothesis of a pacification trend been fundamentally refuted, or are we only observing contradictions and tensions inherent to this trend’s long-term development? All lectures will be held at the Westend Campus, Hörsaalzentrum HZ 9, and begin at 6:15pm.